When you cook from scratch, you’re eventually going to notice that not all ingredients are created equal. Fresh tomatoes from your backyard are not like the perfectly-round, perfectly-red, perfectly flavorless ones at the grocery store. Some brands of flour rise more than other brands. Is your pasta made from “hard winter wheat” or “100% durum semolina”? Or are they the same thing? Eventually it will occur to you that maybe beef isn’t all the same either. You’ve probably noticed “Angus” on some packages, but other than that do you have any idea where your meat came from? Or why it might be better (or worse) than another brand? Does beef even have different brands? As a matter of fact, it does. And one of the biggest differences you can find is whether the beef is grass fed or corn fed. Unless you’re older than dirt — or not living in the U.S. — you probably grew up hearing “corn fed” as a generally positive idea. You probably didn’t hear that cows are unable to digest corn. Trying to feed corn to a cow is like trying to feed tree bark to a human. They’re just not built for it. Without getting into the biology of it, the condensed version is that feeding corn to cows makes them sick. So sick that they would die within a few months, before they’re big enough to turn them into steaks. To fix this, you can feed them grass, which they are built for, or … you can load up the corn with antibiotics. Roughly 70 percent of the total antibiotics used in the United States are consumed by healthy farm animals. If you’re interested in how we got here, including the biology, financing and politics behind modern industrial livestock production, start with The Omnivore’s Dilemma: A Natural History of Four Meals by Michael Pollan. He includes references to all his sources if you want to follow up more. So you’ve read up on why corn fed beef is not just bad for you — or at the very least not as nutritious as it should be — but also bad for the environment. You go to your local grocery store and ask them if they have grass fed beef. Odds are even the butcher there won’t know what you’re talking about. Most people really don’t know there’s an alternative. If you’re lucky, you can find a local farmer or CSA (Community Supported Agriculture ) program that raises grass fed beef. And if you’re luckier than I am, they won’t have a waiting list that’s two years long just to get in. The other option is to mail order your grass fed beef, frozen and packed in dry ice. Omaha Steaks has been doing this for years, so the idea of mail order beef isn’t that groundbreaking. At Google you can find lots of suppliers of mail order grass fed beef. But should you? From a health perspective it’s almost definitely better for you. Some people may be more sensitive than others to the decreased nutritional content, and possible pharmaceutical remnants, in corn fed beef. There are anecdotal reports of various immune system diseases that are alleviated by a switch away from corn fed beef products. Over the long term, heavy reliance on antibiotics carries the risk of developing antibiotic-resistant “superbugs”. By dosing the cattle so they can eat a diet they’re not biologically equipped for, we risk a return to the days when pandemics wiped out 30% of the population in a year’s time. From an environmental standpoint, it’s more of a mixed bag. The environmental impact of the traditional farming process is far better than the modern CAFO (Concentrated Animal Feeding Operation). See the Sierra Club report on factory farms for plenty of details. However, mail order beef has to be frozen and shipped sometimes long distances. The environment impact of the transportation and handling is probably higher, on a per-pound basis, than the impact from higher volume systems. I personally think this analysis would favor the grass fed and mail order even today, but more importantly it is a step toward more sane practices in the future. Still, there are some people — most notably natural farming celebrity Joel Salatin of Polyface Farms — who oppose the idea of using natural farming practices only to ship the products cross-country. If you compare mail order grass fed to supermarket beef, it’s no contest. The supermarket will be much cheaper. And while that matters when it comes time to feed your family, it doesn’t actually say anything about whether it would be more expensive if your supermarket chose to carry it. If you compare premium mail order grain fed and grass fed beef, you may find that the grass fed is actually less expensive. However the price, like the flavor, is more subject to seasonal variation. Just like fruits and vegetables have a season, so does beef. This may be one of the biggest barriers to consumer acceptance of grass fed beef, as we have been trained to expect the same exact cut of meat every time. Last but not least is taste. 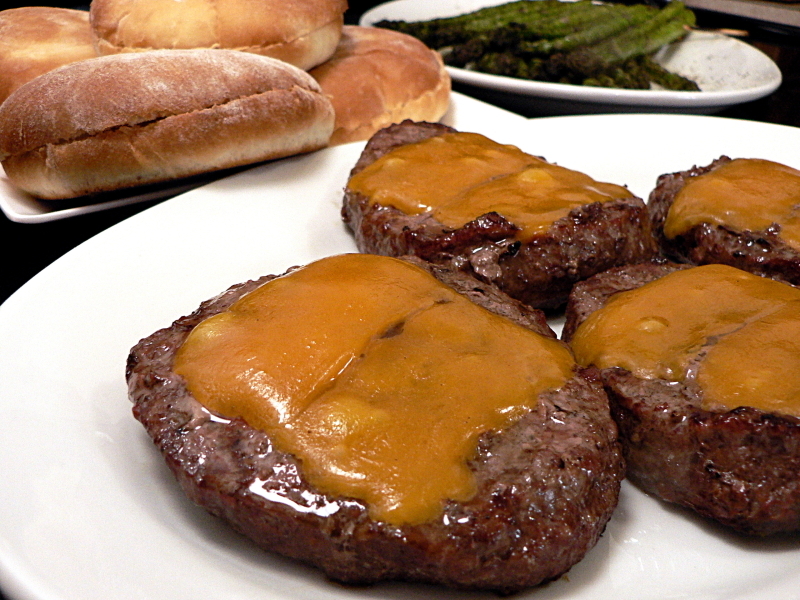 Fans say that grass fed beef is more flavorful, and has a better texture. But to say that it’s noticeably different, means that it won’t be what people are used to. And lots of people like their steak and hamburgers just the way they are. Keeping in mind what I said about seasonal variation, you can generally expect grass fed beef to be leaner than grain fed. The texture may not be as tender, and you will need to cook slower at a lower temperature than you are used to. 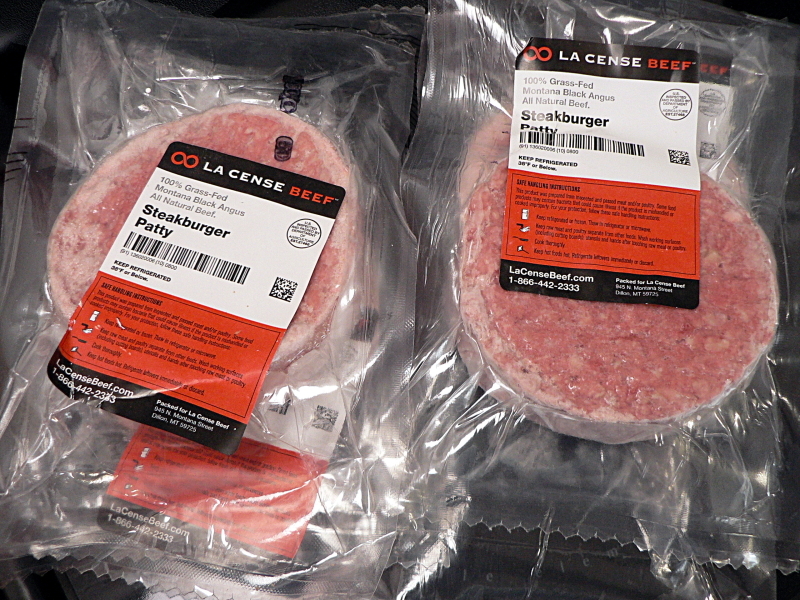 These burgers are 6 ounce LaCense steakburger patties. “A blend of our Sirloin Steak, Round Roast, Chuck Roast and Flank Steak, our Steak Burger Patties are 85% lean.” They come to $8/pound plus shipping. Considering what goes into it, I really should be comparing the price to steak, so it’s pretty close. The regular ground beef is $5.75/pound, so definitely more than I’m used to paying. I had read the suggestions to cook them lower and slower, so I had the grill set about half as high as I normally would. They started from frozen, and I flipped them for the first time when the bottom started to drip a little fat. Pretty soon the dripping fat was flaring up, just like I’m used to with grocery store hamburger. I had to move them around to keep them from burning, I had to avoid sticking my hands in flare ups … basically it was just like cooking “regular” burgers. I couldn’t get these special burgers then put them on any old buns, so I made my own potato buns from scratch. (I’ll have that recipe up shortly.) Yes, the lettuce, tomato and onion were from the grocery store. But I live in Cleveland, and I don’t know anyone with a greenhouse, so I’m kind of limited there. So how was it? The texture was definitely less tender than I’m used to. But I’m used to making my own burgers, which include bread crumbs, egg and sometimes shredded onion. And they’re never frozen. So can I say that the texture difference was definitely because of the beef? Not really. The flavor was really good. All I used was salt and pepper while I was grilling them, and nothing mixed in with it. Again, I usually mix plenty of flavor into my burgers. But I can say that these had much more “beefy” flavor than the store bought frozen patties I sometimes get at parties and picnics. My wife and I agree that there’s something about the taste and texture that’s bringing up a childhood memory. Neither one of us can exactly place it. It may just be that we once had grass fed beef before the industry moved so completely to CAFOs. It may be a recipe or a specific prepared food our mothers used to make. I can’t put my finger on it and it’s driving me crazy. Bottom line: Much as I’d like to, I can’t afford to eat like this every day. But for the first cookout of the spring? My birthday later this summer? Oh yeah, I’ll be getting some more steakburgers. And I’m going to talk to my butcher about carrying grass fed beef. Maybe he can jump ahead of the waiting list. 1) A CSA is a buying group, where people buy shares in the produce from a local farm. Typically they commit to a price in advance, and each week they receive a shipment of whatever was harvested that week. 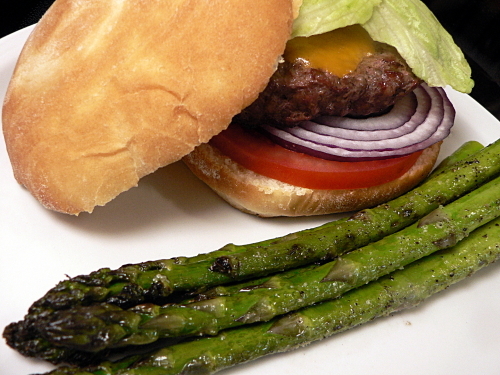 CSAs that offer meat generally take orders in advance and produce to order. Check Local Harvest to find your nearest CSA. 2) Most of these reports are from people making wholesale changes to their diet, so it’s impossible to attribute the results to a single factor. This same criticism, however, can be leveled at most of the studies used by the agriculture industry to support their current practices. 3) It should be obvious that, if you want everything to meet the same standard, it’s easier to lower the standard than to improve the product.